You can see in the photos, there is quite a bit of color and pattern variation in these. This is achieved from heat treating (see gem description) and does not seem to dull its healing properties, in fact they seem a bit more energetic than other carnelian or agates. Crab Fire Agate promotes steadfastness and will encourage a spirit of community. These are a medium size of 1" with some being slightly larger. Stimulates, balances and heals womens reproductive system. Helps alleviate premenstrual syndrome, irregular cycles and cramps. Aids in creativity of all sorts, raises moods, warms and brings the ability to experience pleasure. Promotes nurturing of self and others, provides the ability to change and helps to establish healthy boundaries. Crab Fire Agate may be used or worn for long periods of time. And being an agate, it will intensify the energies of other stones. Crab Fire Agate promotes steadfastness and will encourage a spirit of community. It will assist in making us willing to help, become idealistic and to stand up for a good cause. Crab Fire Agate will bring steadfastness and courage. Not a risky heroic courage, but an everyday type of courage to stand up to difficulties. It also lifts our emotions. 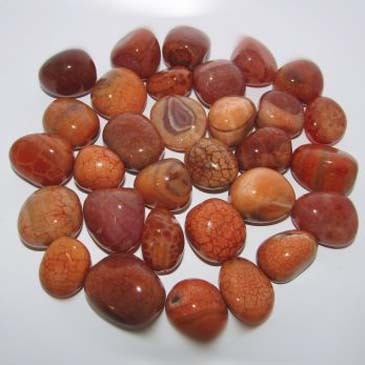 Crab Fire Agate will assist us in solving problems quickly and pragmatically. It will help to bring actions that are started to a proper conclusion and bring a sense of reality whenever you are feeling confused. 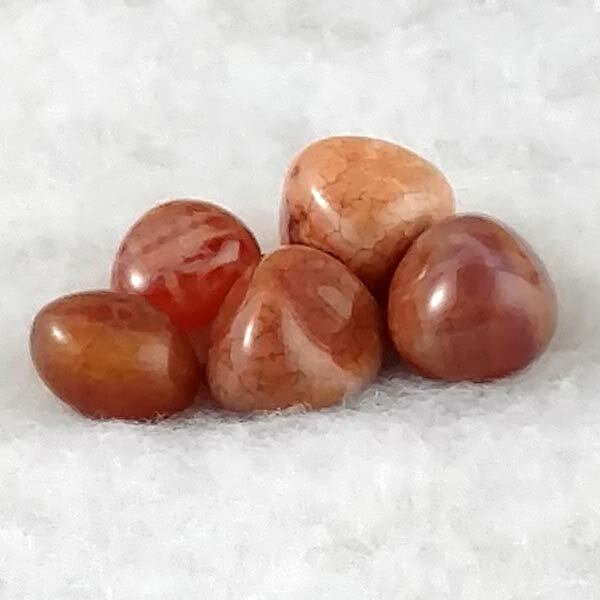 Crab Fire Agate can stimulate the absorption of vitamins, nutrients and minerals in the small intestine which will improve the quality of your blood. It will also ensure a good blood supply to organs and tissues. It has been known to alleviate rheumatism and to stimulate the metabolism. 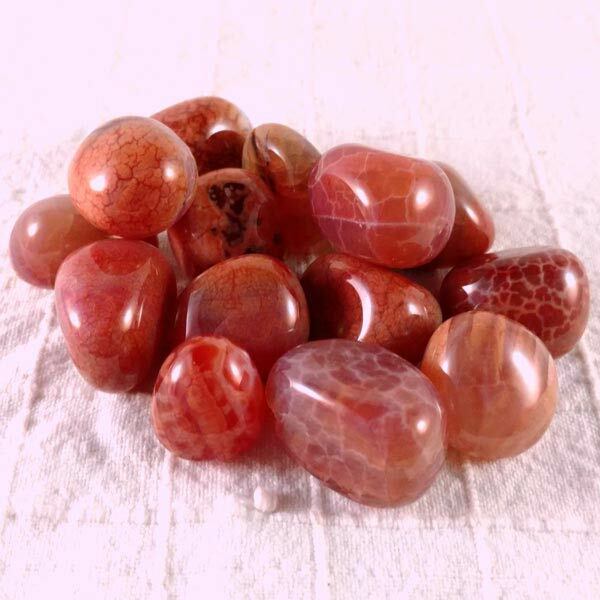 Crab Fire Agate has special affinities with Aries, Leo, Virgo and Capricorn. It has a Projective Energy, its Planet is the Sun and its Element is Fire. Because this one is a "new" development in gems available to us there is no history on it. So, I'm providing what is known for Carnelian. Carnelian was also worn on the hand in ancient Egypt to still anger, jealosy, envy and hatred. In Renaissance magic, Carnelian was engraved with a sword or an image of a warrior and used as an amulet to guard homes from lightening and storms or to protect the wearer from enchantments. It has been noted that if a person dreams of Carnelian it is said to portend an impending problem. It is also said to be the gem of guardian angel Hamatiel.